Implementing Response to Intervention (RtI)/Targeted Intervention (TI) just got even easier with Penda Learning! Until now, teachers were able to assign Penda activities to their classes to support RtI Level 1 or to intervention groups they created within their account to support RtI Level 2. Now, Penda offers teachers the ability to assign individual Penda activities to specific students to support RtI Level 3! 1. Sign into your Penda Learning teacher account. 2. Browse/find a Penda activity you wish to assign to an individual student. 3. Select the check box next to the activity then click "Assign Work." 4. 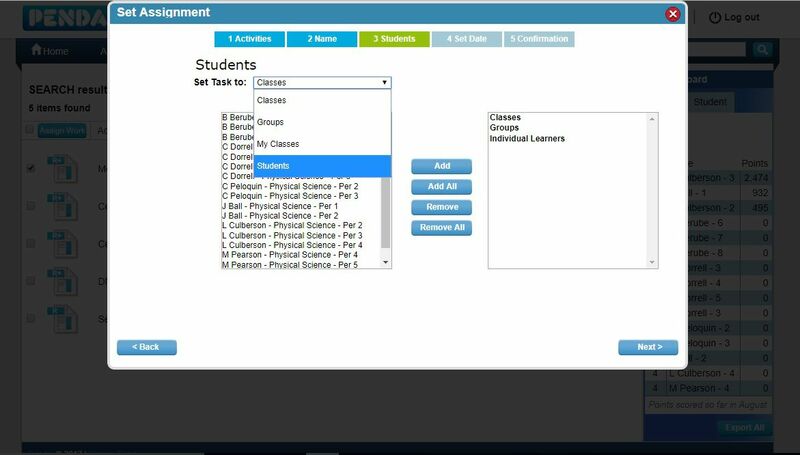 Proceed through each of the screens within the Assignment Wizard as you normally would, arriving at screen # 3 - Students. 5. Select "Students" from the Set Task To drop-down menu. 6. A full listing of students will be revealed, allowing you to select the student(s) you wish - click on the student then click "add" to move their name into the right box. 7. The student name will appear under the "Individual Learners" heading. 8. Proceed through screens 4 and 5 to complete the assignment process. Click here for more information about how Penda Learning support Response to Intervention (RtI)/Targeted Intervention (TI).